One thing that I admire about designer Tom Britt's work is that it is usually loaded with personality. No where is this more true than in this Long Island home that Britt decorated back in the late 1960s, a house that in fact possessed many different personalities. Ignoring the generally held belief that a house should be a sum of like-minded rooms, Britt gave each room its own arresting color palette. Bright yellows, pinks, blues, and greens were used throughout. What unified the home and kept it from seeming schizophrenic were the red painted floors and white walls that were found throughout the house. 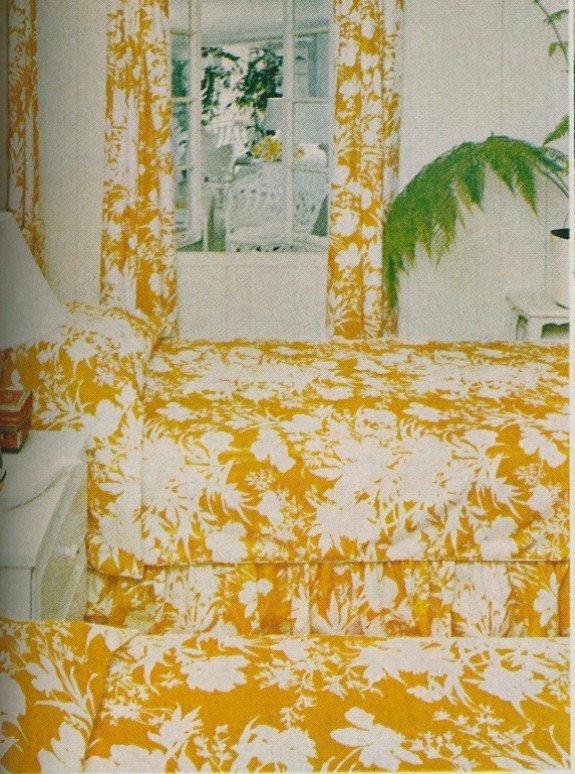 The most interesting twist to this house, though, is that Britt employed the same three fabrics throughout the house, though he used them in different colorways for each room: in the living room, a palm tree and animal motif print appears in both a pink and white colorway as well as in a stronger pink and yellow version; in the master bedroom, a punchy floral print was used in what appears to be a warm orange color, while in the guest bedroom, it shows up in yellow; in two guest rooms, the same plaid fabric was used in both a green and a blue colorway. If you want to do as Britt did and use the same fabrics multiple times but in different colors, you might want to consider using some of Quadrille's prints for a similar effect. 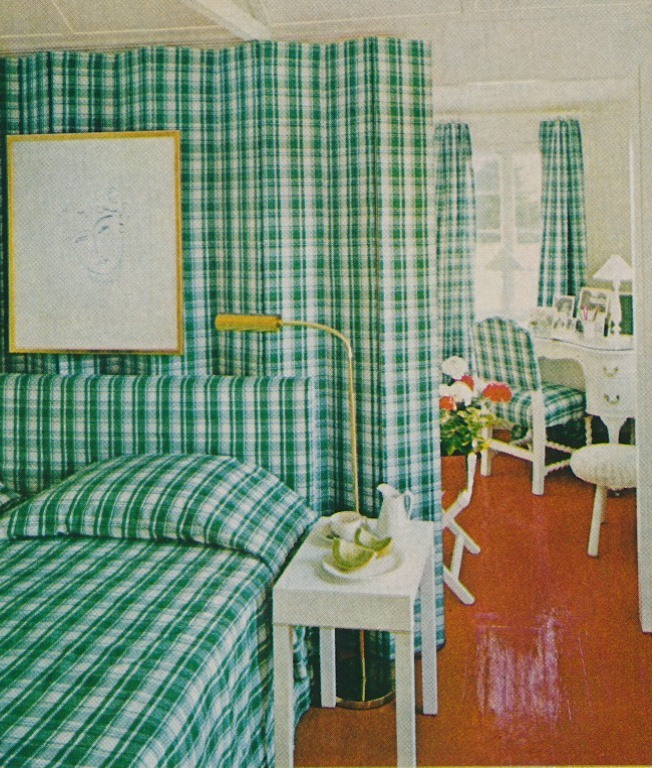 But, I do think that giving each room its own unique look is something that should be done with caution. 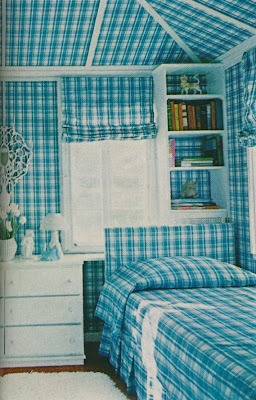 I personally think it's easier to decorate your home's rooms so that they're all on the same page, but then, I'm not Tom Britt. 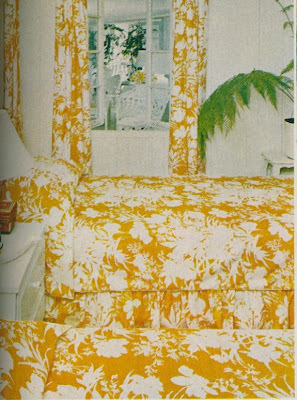 A Guest Bedroom which had the same fabric as that in the master bedroom, though here it was used in the yellow version. ...and another Guest Bedroom with the blue and white version. 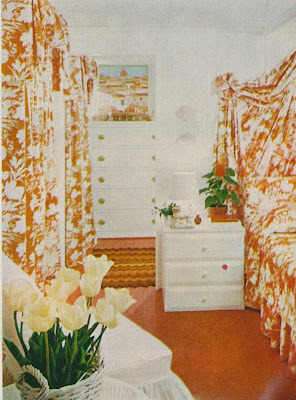 All photos from House Beautiful, July 1968, Faulconer-Fenn photographers. Isn't it amazing that the pink, red & orange living room looks so current today! I love it! Britt is a Master of Design! His saturated colors always have me in awe. I am also proud that Tom is from Kansas City! Britt is fantastic. I love repeating fabrics. Thanks for a great post! If these were all public rooms, the array of colors might seem a bit of a jumble, but the fact that they're all guest rooms means that Britt & his housekeeper are the only people to see them all at once. And it makes for a nice rotation of color scheme for frequent guests. Then again, if Britt is as much fun as Mrs Blandings says he is, getting an invitation to spend a weeekend would be enough for me--even if it meant I had to sleep on the sofa. I agree that Britt is an amazing designer, and I too would love to meet him! Mrs. B has us all dying to spend time with him! 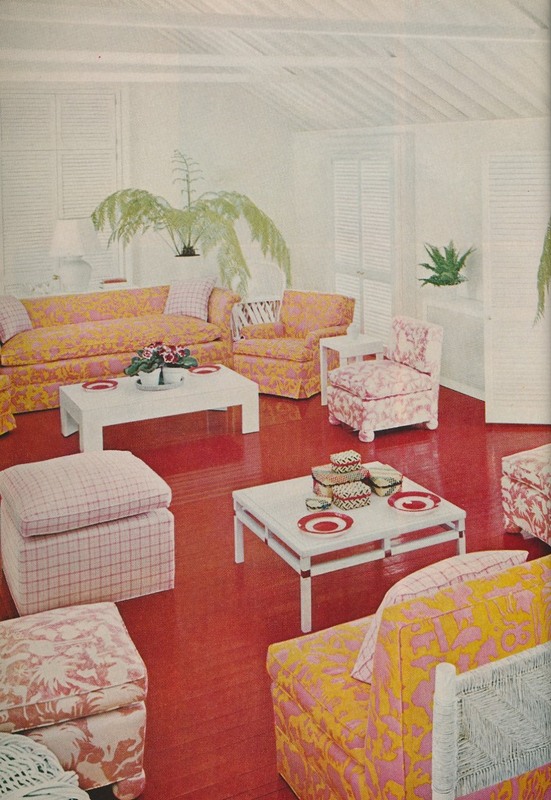 I love Tom Britt's fearlessness mixing colors and patterns in this house. I also have been dying to use those Quadrille toils, but have not had the right project for them yet. Jennifer, what a great post and how timely - Tom's fantastical house in the Hamptons is coming up in a spring issue of Veranda, written by moi. I have known him for years and he is a complete Character. You can sort of tell by his decorating, but honey that is only half the story. He is also very knowledgeable, which gives his designs a depth that reaches far beyond window dressing. Frances, Can't wait to read the article! So "peak of chic", this kind of research! Isnt this just what a beach house is all about....we should all take notice. Thank you.